"Michael was a healthy, energetic, fun-loving 12 year old boy when he was diagnosed with DIPG (Diffuse Intrinsic Pontine Glioma) due to issues with his balance. He died one week later." Michael's Mom, Betsy, shared the following details of Michael's journey in hopes to help others in some way as she stated "Michael would have wanted to help them too." "Michael was to begin radiation the day he passed away. It all happened so fast. His tumor was so aggressive. We took him to Geisinger in Danville and were waiting on a 2nd opinion from CHOP. He was diagnosed on a Monday. We went to Geisinger on Tuesday to meet with the Neurologist and Oncologist. Sent out the info to CHOP on Wednesday. Michael was in a wheelchair by Wednesday. Thursday we had not heard back from CHOP and Michael was declining so quickly we called Geisinger and got him scheduled to begin treatment Monday. He started on steroids that day and Thursday afternoon and evening did great, was eating and laughing and gaming. Friday morning he had thrown up and poor kid couldn’t even lift up his head. He was flailing his arm from the couch to get my attention. He could barely move, barely swallow his meds, barely talk, couldn’t go to the bathroom. These are end stage DIPG symptoms. Back to the ER we went and after being there all day and talking with Doctors made the decision to move him to inpatient hospice. Hardest thing ever is to watch your child die before your eyes. Lose his sight, uncontrolled body movements, not able to eat or drink. Trying to comfort him while I am crushed, in denial. He finally went into a coma on Sunday night and died at 10:20 Monday morning. These kids never lose their cognitive ability. They are fully aware of what is happening to them." Michael enjoyed gaming, basketball and loved going to the beach. He is forever loved by his mother and sisters. 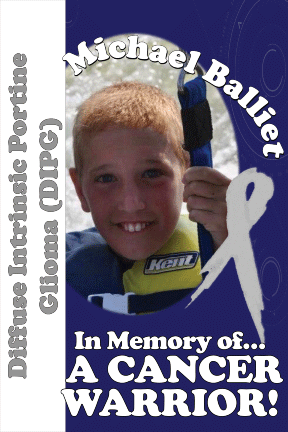 There is no cure for DIPG which only affects children and young adults.